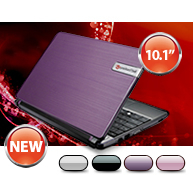 A Packard Bell netbook is the ideal accessory for organising your life and keeping in touch on the go. Our new netbook range includes improved designs, handier features, and amazing battery life. Take a look at the new lineup today. Optimized for chic digital mobility, the dot s provides smart on-the-go features and a cool design. It's the complete solution for non-stop social networking in style!